Good news for those that are looking for way to convert their old negative films to digital photos. Now the Digital Film Scanner can do this in simple steps. Although there are still shops that can develop the negative films into analog photos, but the existence has been gradually replaced by camera shops that only focus on digital printing. So, the kit has come in the right time to fill up the generation gap. The operation is pretty straight forward. 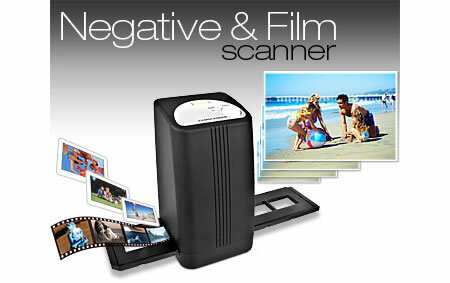 With only a few steps, users can turn their negative films into digital copies using this special kit. Its functions are not only limited to scanning, conversion, printing but also including pictures editing that cannot be accomplished with the old analog photos development. With the software assistance that bundled with the package, users have the ability to crop, edit and save it into famous Jpeg or tiff formats, making it easier to be viewed in computer screen or even printed out to be stored in album. In terms of hardware, it features 5-Megapixies SMOS scanner sensor that can produce high resolution digital photos in a minutes with 3600 dpi photo enhancement. At the retail price of $162, it is quite expensive for home users. But if it can digitize and conserve your favorite photos in old days, then it is still worth the price.